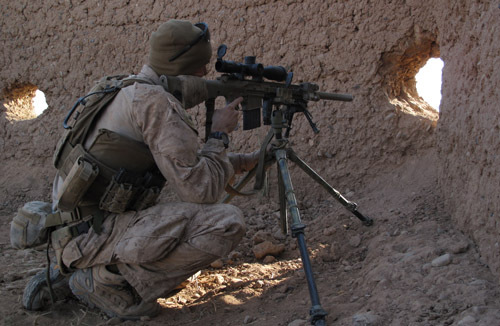 TREK NAWA, Afghanistan – In the chilly dark night, a telltale sound made it clear the scout sniper team was inside the mud compound. CLINK. CLINK. CLINK. The Marines swung axes, hammers and other tools at the mud walls, preparing for a morning attack on Taliban fighters in the surrounding countryside. U.S. snipers use the tools to knock “murder holes” into a compound’s walls, creating “hides” from which they observe and engage targets. It has been widely reported that insurgents use the holes against coalition forces, but they’re not the only ones. It’s a smart tactic: The snipers can observe a region and establish positive identification on an insurgent, all from the relative safety of a compound’s walls. I saw the practice in action early Thursday in Trek Nawa, the volatile area between Marjah and Nawa districts. The Marines with Blackheart 2, a scout sniper unit with 1st Battalion, 1st Marines, out of Camp Pendleton, Calif., took me along on a mission that left the wire well before dawn – a rare opportunity for a journalist. The eight-man team, led by Sgt. Joshua Ott, also had an interpreter and three Afghan soldiers along for the operation. Two of the Afghans were armed with Remington 700s, a 7.62mm sniper rifle made in the U.S.
I’ll withhold additional details for now because I’m preparing a long-form narrative story about the mission and scout sniper operations in Afghanistan. It’s fair to say, however, that it was a bad day for the Taliban. On an unrelated note, photographer Colin Kelly and I have since moved back to Camp Leatherneck, the Marine Corps’ largest base in Afghanistan. We’re preparing for our eventual departure back to the U.S. We’d like to thank the Marines we embedded with along the way and all of you who have visited this blog during our month in Helmand province. We’ll have plenty many more anecdotes and photos from the trip to share in coming days. Great Job!! My son Cpl Scott Richmond is in this unit and on Nov. 3rd will be spending his 21st Birthday in that place… What a place for him to spend his 21st Birthday… Thanks for keeping us informed on the units good work! To Charles Richmond: Best wishes to your son on his 21st birthday. Sadly, I don’t think he will be able to celebrate by going into a bar and ordering a drink legally. It’s just not that sort of place. In my day I and my friends were lucky to have a draft card (the universal ID in bars then) with our birthdate coded into the draft number. Being born in 1938, meant you had a “38” in the code, which could very easily be changed with a bit of candle wax (so if the cops demanded your card you could thumbnail the wax off and be alcohol illegal but not federal illegal) into a “36”. I remember Quinn, of Quinn’s bar in Boise, Idaho, leaning over the bar to wish me a happy birthday and remark that the birthday was sort of useless, as I and my friends had been downing Tom Collinses there for two years. I hope your son finds a more congenial location.